Finding true joy in life shouldn’t be a treasure hunt. 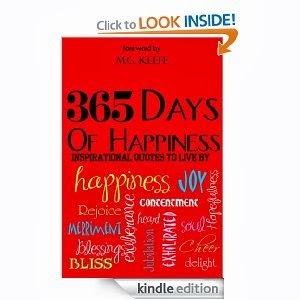 Enjoy this collection of quotes, based on appreciating life’s pleasures and finding happiness. 365 quotes to make you laugh, smile and cry. This planet has--or rather had--a problem, which was this: most of the people living on it were unhappy for pretty much of the time. Many solutions were suggested for this problem, but most of these were largely concerned with the movements of small green pieces of paper, which as odd because on the whole it wasn't the small green pieces of paper that were unhappy. ~ Douglas Adams. The older I get, the happier I want to be. I've learned happiness comes in many forms, but really, it is mostly in the little things. If you follow my Facebook, you would have noticed my status is a happiness quote every day. This is the book I get it from. Each quote leaves me pondering what it means and the depth of it. I also think about how it plays in my life, or how I can implement the teaching into my life. If you are a lover of quotes like I am, this book is totally for you. And for your information, it is still free on Amazon.